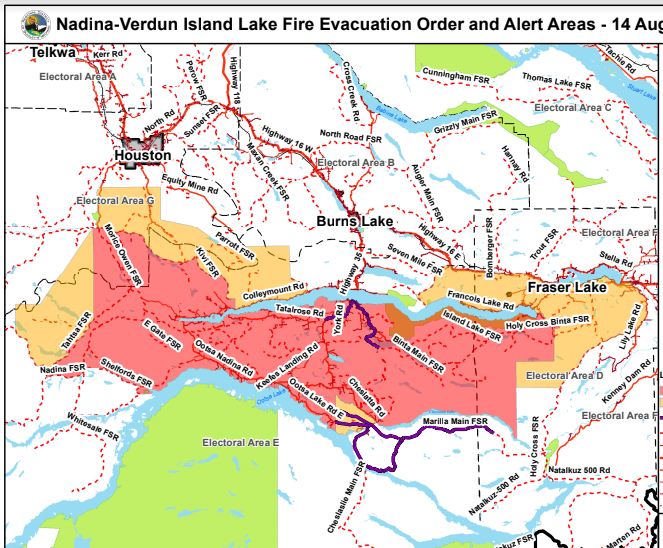 The Regional District of Bulkley-Nechako has issued an expansion to the Evacuation Order and Evacuation Alert for the Nadina-Verdun fire. The Evacuation Order is in effect west of Tahtsa Forest Service Road (south Francois) to 400 metres east of Nithi Road, Nithi Pit Road and a portion of Holy Cross Binta FSR. Francois Lake south Ootsa Lake and Cheslatta Lake. West of Morice Owen FSR (north Francois) to Kivi FSR. The recommended evacuation route will remain open until safe travel is compromised. The Francois Lake Forester Ferry will be operating extended hours as required to support the needs of the Evacuation Order. Anyone in the Evacuation Order area should leave immediately. Evacuees are asked to register at a nearby reception centre including at the College of New Caledonia in Burns Lake and in the back entrance of the CN Centre in Prince George. 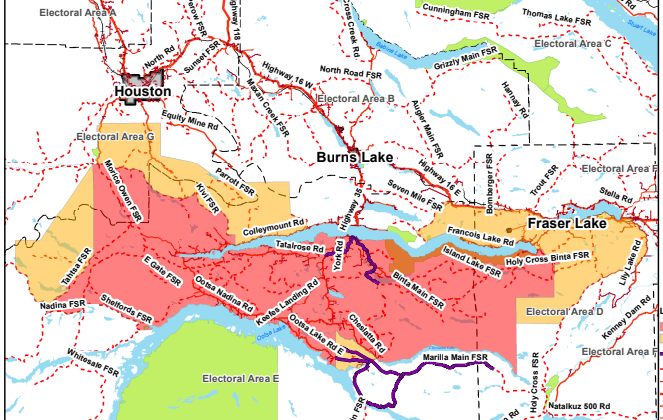 An evacuation Alert affected the area approximately 8 km south of the District of Houston to Ootsa Lake; and Glacier FSR to the middle of Cheslatta Lake – Nechako Reservoir. Anyone with additional questions or needing extra assistance should contact the RDBN directly.